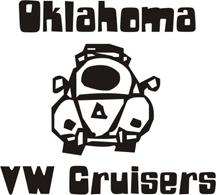 Oklahoma Vw Cruisers • 1972 Super Beetle stalled. I have a 1972 SB with the standard 1600 engine with a manual transmission. While I was driving to work I got about 20 miles away from the house and the engine started hesitating and stalled. It felt like it was out of gas, but the tank is full. I put an empty cigarette pack in the deck lid to work as a stand off and got to work without any issues. If it helps, I was travelling south at 65 mph, the outside air temp was 84 degrees Fahrenheit, the wind is from the south at 9 mph with wind gusts of 18 mph, and the humidity was 39%. My running temperature was at about 105 degrees Celsius. Sorry, I don't know the conversion. Any idea what the problem may be? I'm stumped. Re: 1972 Super Beetle stalled. If your timing is good and your fan spins, I would forget overheating, unless your motor is built wrong. Check to make sure your fuel lines are not sitting on the exhaust or block directly. Looj near trans under car. Make sure no garbage in the fan. Drive it a mile or 2, look at fuel filter. Full? Then drive till it dies. Look again, full or not? If not full, take gas cap off. Wait a min, then start and leave cap off. If ok, need a vented cap. If not, then another prob. It drove home without doing it again, but now it won't idle. I'm going to tinker with the carb and see if that helps any. I hate to ask, but how do I get to the fan? Do I have to pull the generator off? What does that entail? I'm still new to VWs. I wouldnt mess with carb too much, at least not adjusting. Wonder if you got trash in the tank. Whats fuel filter look like? If it stalled out now dont idle might be dirt in a jet. Fan, just reach behind the shroud, motor off! I was really hoping that the motor wouldn't have to be pulled. I have no clue how to do it. I noticed that the valves are chattering a little more, so I'll be doing a valve adjustment and an oil change this weekend. think simpler. check the things i said above. Sorry, it's been a long day. I thought I read "motor out" not "motor off." Fortunately I didn't have time to work on it today. Do you have an electronic ignition or points???? For it being erratic and not constant I would assume it would be a gas issue... Like he said if you have junk in the tank flush it and get a new fuel filter and flush out the line and possibly the carb. I know you mentioned u got a new carb, but in my experience they arent always right. You might have to pull it apart and clean it too and set float level. Check your plugs, wires, cap & rotor. Along with timing. I removed the rain guard from the louvers on my engine cover and the engine runs about 30 to 40 degrees cooler. Weird, huh? I haven't had another issue with it stalling since it first did it to me. I have a new distributor cap and rotor to put on because the one on there is starting to show wear. I recently replaced the points and have a new condenser in the glove box. The old one is still working. All my cooling tins are in place, I did find some leaves in them which were removed, it didn't change the temp any though. When I got to work today I looked at the fuel filter and noticed that it had very little gas in it, it was full when I left the house. I will be checking the fuel tank vent to see what's going on there. Thanks for all the advise so far, I may need more later. It really sounds like a venting issue with the gas tank. If it stalls again, open the gas cap and listen for a sucking sound. If you hear one, it is not getting air and creating a vacuum. If its not fixed, once the weather turns hot you will have a flooding issue when the tank pressurizes. Easy fix with varying symptoms that make it hard to pinpoint. I must be missing the vent, I can't find it. What should I be looking for? I was having an issue with idling after the stall and found that Empi carbs are absolute crap. I had to adjust the volume screw to get the idle rpms where they need to be. It almost feels like they forgot to put an o-ring in there. The valves were just a little loose, so I adjusted them to spec, I'm using the Bentley Manual. Now she runs pretty sweet. When I changed the distributor the number 4 tower had a white dust in it when I pulled the wire. Is this a symptom of something I should worry about? empi carb is crap because you had to adjust it? LOL. you have to adjust all carbs! Also like i mentioned in your other post, they are historically alittle lean out of the box. I was saying that it's crap because I have to adjust it every 4 to 5 days. You were right. One of the rubber things on my intake manifold had a hole in it. It's "sealed" for now with some electrical tape. Where can I find a replacement? What are they called? any vw shop, if there are none up there, you would be surprised what oreileys can get in 1 day from the warehouse. 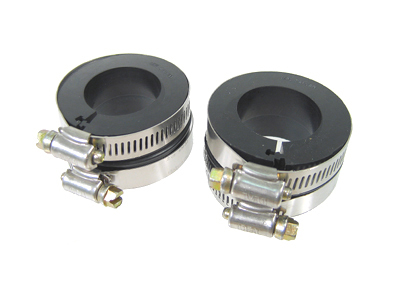 I found a kit with 2 boots and intake gaskets for $8.50 plus $14.04 shipping. I may order it and just replace all of it. Any thoughts? I also want to find an a/c compressor. I have everything but that to put an a/c unit in. you will have lots of trouble with the ac, lines being millions of years old etc. I ordered a set of split boots to replace the worn ones. We'll see how well that works. When I have enough free time I'm going to take all the a/c components out and see what I can get for them. I also have 4 boxes of spare parts that came with the car, most are junk but I can scrap those and clean up some of the better parts. Never used split boots before. Gotta be better than a torn one. This is the type I'm using. It'll save me from having to remove the intake manifold. I can cut the old ones off with a pocket knife and install these. The sad thing is that I have a very good idea what caused the old one to blow out. When I installed the points I didn't gap them and tried to start the motor. HUGE MISTAKE. It threw a fireball out of the carb and stripped the screw for the air breather. It's a wonder it didn't ruin anything else. use a piece of cardboard if you dont have a feeler gauge. Like from a matchbook or the like. I bought a set of blade type feeler gauges after that happened. I'm due for an oil change, so I'm going to check the point gap before I warm up the motor. Can't get much for all that a/c stuff. I pulled a system out of one of my supers and can't even give it away. Since I won't get much for my a/c stuff I'll hold on to it. You wouldn't by chance have a compressor laying around, would you? That's the only piece I'm missing. If so, I get paid on the 27th and will gladly purchase it from you. I do have a compressor laying around. It even worked when I pulled it out. Let me know when you want to come get it. How much do you want? Where are you located? Due to a shipping error my parts were sent back to the store. I get a full refund, but that leaves me without the boots. Oh well, I'll see what there is locally.